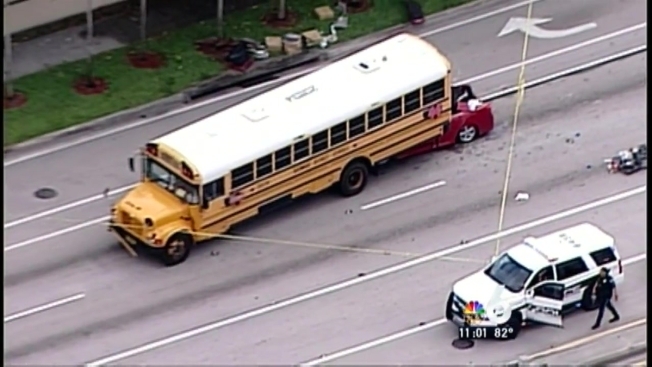 A driver was killed in Pembroke Pines Thursday morning after slamming into the rear of a school bus at a traffic light. Pembroke Pines Police say the Broward County School Bus driver was stopped at a red light at 10000 Pembroke Road around 6:30 a.m.
That's when police say the driver of a 2013 red Toyota Camry came up behind the bus and did not stop, crashing into the rear of the bus. The Camry became wedged and pinned under the bus. The driver of the Camry, 36-year-old Dean Eric Bass, died at the scene. His passenger in that car, 55-year-old Claude Murray Jr., was transported to Memorial Regional Hospital with serious injuries. There were no students on the school bus at the time of the crash, police say. The driver of the school bus was not injured. Pembroke Road westbound was closed between Douglas Road and Palm Avenue as officials responded to the crash.